Word of the Day – " steigen" | German is easy! Steigen is one of these verbs that kind of flies below the radar of many students even thoug it is a super useful word that you can hear or see every day. And not only steigen itself. There are several cool prefix versions, some funky differences between these versions, some annoying things about translating them to English and there are also one or two or three or four or five surprising family members. So we definitely have enough to talk about, and I’d say let’s get on board of the Steigen-Express… “Einsteigen bitte”, doors are closing, and off we go :). Now, walking up stairs or hiking up a mountain are not only good visual images, they’re also actual meanings of steigen because the verb really hasn’t changed much over the years. Walking up stairs keeps you fit. Gibt es Müsli extra für Bergsteiger? Is there a muesli specifically for climbers/mountaineers? Now, the fact that the original idea of the verb is still alive doesn’t mean that there has been some evolution of course. First of, there are a couple of related words that are focused on the walking: der Steig and der Steg. Steig is ultra-uber-don’t-even-use-it rare … except in the combination with Bürger. And no, I’m not gonna do that bun.. oh… too late. Anyway, Bürger, which comes from Burg by the way, means citizen. A Bürgersteig is where the citizens walk… the side walk. Ich sitze gerne auf dem Steg und gucke auf den See. I like sitting on the dock looking at the lake. Viele junge Mädchen träumen von einer Karriere auf dem Laufsteg. Many young girls dream of a career on the catwalk/runway. Auf dem Bürgersteig bitte absteigen. Please get off the bike on the sidewalk. Now, the last example has absteigen in it and that brings us right to a very important group of prefix versions of steigen that are all about getting on or off or in or out of means of transportation. Back in the day people used horses and horse carriages and ox carriage and there you had to “climb up” the Steigbügel (stirrup…. and this is also related to steigen) or some stairs. Same for old trains, buses and the first cars. Today, And even today you have to make a somewhat stride-y step to get on certain trains. So people kept the verb even though today’s buses with their awesome tilt technology are like “I’m gonna bend down for you so you can get in”… wait… I think that’s what she s… anyways. There are five verbs in total. Einsteigen and aussteigen are getting in/on and off and they work for cars, trams, buses, heck even planes. Aufsteigen and absteigen are for bikes and motorcycles (because you’re really on top) and leaving one transportation thingy to enter another is umsteigen. And then there is zusteigen which means to enter a bus or a train in which there are already some people… so it just shifts the focus a bit on the idea of joining the others. But I only ever hear it in trains when they welcome new travelers. Oh, and if you need a noun… that’ll be der [blah]-stieg. Thomas steigt aus dem Porsche aus. Thomas gets out of the Porsche. Erst aussteigen lassen, dann einsteigen. Let people get out before you enter. Nächster Halt Ostbahnhof. Ausstieg links. Next stop Ostbahnhof. Exit on the left. Now, this traffic context is super important but the verbs are not limited to it. Especially einsteigen and aussteigen are used in a broader, more abstract sense of getting in/out of things… mostly for projects or deals or bets or stuff like that. The Lumix 60E camera is the perfect model for beginners/novices. Die Lumix 60E Kamera ist das perfekte Einsteigermodel. Legalisierungsgegner bezeichnen Marijuana als Einstiegsdroge. Those opposed to legalization call Marijuana a starter drug. Der Regisseur ist aus dem Projekt ausgestiegen. The director (film) left the project. Der Atomaustieg ist nicht unumstritten, und der Umstieg auf erneuerbare Energien geht nicht von heute auf morgen. The exit from nuclear power is controversial and the a transition/switch to renewable energies can’t be done overnight. Now, let’s get to the other part of steigen. And that is all about the upward notion. Lit. : The tension is increasing. Im Herbst lassen Kinder gerne Drachen steigen. Lit. : In fall kids like to let dragons soar/rise. In fall kids like to fly a kite. Die Chancen auf ein Date sind nach der Sache auf der Party nicht gerade gestiegen. Chances for a date didn’t exactly increase after that thing at the party. Heute haben in Berlin 10.000 Menschen gegen steigende Mieten demonstriert. Today 10.000 rallied against rising rent. Die Nachfrage nach glutenfreien Produkten steigt seit Jahren kontinuierlich an. The demand for gluten free products has been increasing continuously for years. Die Politik will einen Anstieg der Arbeitslosigkeit verhindern. Politics wants to prevent an increase in unemployment. Thomas steigt in der Firma auf. Thomas makes a career in the company/rises through the ranks. Vom Teich steigt Nebel auf. Fog is rising from the pond. Der steile Aufstieg der Partei ist schwer zu erklären. The rapid rise of the party is hard to explain. So these were the most important steigen-words, I think. There are a few more out there and you might find the ones we’ve talked about in some new situations too but I think with the help of context you’ll get the meanings just fine. Here are a few examples where you can train. Popcorn übersteigt leider mein Budget. Wenn das Team nicht absteigen will, müssen sich die Spieler sehr steigern. The road is super steep. The incline is almost 40°. Too bad, popcorn exceeds my budget. If the team doesn’t want to be relegated/go to a lower division, the players will have to step it up/play better. Supermärkte versuchen mit allerlei Tricks die Umsätze zu steigern. Super markets are trying all kinds of tricks to increase the sales/turnover. Der Student hat sich sehr gesteigert. The student has improved/(stepped up his game) a lot. Eine Stunde für 10 Kilometer… ist noch nicht wirklich schnell, aber definitiv eine Steigerung gegenüber letztem Jahr. One hour for 10 kilometers… not really fast yet but definitely an improvement over last year. Steigern has prefix verbs of it’s own. The most common one is probably versteigern which combines the “make higher” of steigern with the away-idea of ver to …. to auction off. A bit random but hey… why not. Ich habe auf E-Bay mein benutztes Jogging T-Shirt versteigert…. chi ching, sag ich nur, chi ching. I auctioned off my used jogging shirt… chi ching, that’s all I’m sayin’! The brother of that is ersteigern which is the same, just from the perspective of the buyer. Ich habe mir eine Couch ersteigert. I bought a couch at an auction. Sorry, dass ich so eifersüchtig war. Ich hab’ dich mit dem Kollegen gesehen und dann hab ich mich in was reingesteigert. Sorry that I was so jealous. I saw you with the colleague and then I just imagined more and more things. Now, it would be good to come up with a really smooth transition but then again, hey… it’s not good to reinsteigern oneself into things too much so… we’re done ;). This was our German Word of the Day steigen. It’s related to the English word stair (and the old sty) The core is to make strides upward, and the two main fields of meaning are getting on and off means of transportation and rising. As always, if you have any questions about any of this just leave me a comment. This entry was posted in Audio Examples, B-Level, Broad Vocabulary, German Prefix Verbs, Verbs. Bookmark the permalink. The excitement/tension ‘builds’ in english. Or ‘mounts’, which seems closer to ‘steigen’. Great information as always! Would you/could you/should you use any of these with the “r version”? Like “Steig mal rein” would seem to sound okay (to my totally non-native ear anyways). Good question and yes, for most of them it works. “Steig mal rein.” This one could be used if someone is in front of a yakuzie (no idea how to spell that :) and you want to motivate them to get in. You would NOT use “steig rein” for the subway though. That would sound super weird. Same for “raufsteigen” and “raussteigen”. They’re not super common but if you spend enough time around German you’ll encounter them. Dies bringt in Erinnerung Der Titel von Kurt Weil’s Oper, Aufstieg und Fall vor der Stadt Mahagonny. Gibt es ein Unterschied zwischen ‘Fall’ und ‘Abstieg’? Ja, “Fall” ist schneller und kompletter. “Abstieg” ist langsam und nicht so unkontrolliert. Das klänge nach einem sehr sehr langweiligen zweiten oder dritten Akt. Hey Emmanuel, Langzeitleser, erstmaliger Kommentiere… Geiler Beitrag, wie immer! Nur ne kleine Frage. Es hat mir lange gedauert, bis ich den Unterschied zwischen “in die Kirche” und “in der Kirche” verstanden hab. Am Ende ziemlich einfach! Aber hier haste “aus dem Porsche” geschrieben. Da es um Bewegung geht hätte ich im Akku geschrieben. Was versteh ich hier falsch? Ganz einfach: “Aus” ist immer mit Dativ :) (hast du wahrscheinlich schon mal gehört). Ja, Wechselpräpositionen sind die, die man mit zwei Tassen und einer Kirsche auf dem Tisch arrangieren kann. Mit “aus” geht das nicht. Da müsste man eine Bewegung machen. Total unheimlich. Ich habe heute morgen den Artikel gelesen, und kurz danach hat ein deutscher Freund von mir das Wort benutzt. Zweimal in einem Tag, aber nie vorher gehört! Toller Artikel wie immer. Aber sicherlich fehlt da “Bahnsteig” yu den Abstammungen von “Steig”. Das hörte ich sehr oft in Deutschland. Oh wow, ja klar. Das hab’ ich total vergessen. Danke!! Hab vergessen das Wort zu erwähnen! Ich meinte /reinsteigern/. Steigen kenne ich ja natürlich ;). Das Phänomen kenn ich auch. Passiert immer, wenn man in der Sprache schon ganz gut ist. Dann schwebt man so dahin, liest, spricht, und versteht eigentlich auch alles. Aber dann lernt man bewusst ein neues Wort und denkt “Oh, das hab ich noch nie gesehen” und dann sieht man es auf einmal ständig. Mir ging das bei Englisch zum Beispiel mit “purport” so. Ich habe das in irgendeinem Buch gelesen und gedacht “Oh, nie gesehn. Ist wohl super selten.” und seitdem ich es aber kenne, sehe ich es ständig, wenn ich was lese. In the German sentence I don’t see any reference to a bike. No you’re not missing anything. The sentence is missing the reference. Here, Germans actually skip stuff for once and leave it up to context. Everybody would understand immediately that you’re talking about a bike. Technically it could be a motorbike, as well, but then you’d say more like “WHAT THE F… DRIVE ON THE FREAKING STREET” and it could be directed at someone riding a horse but I don’t know if they actually have to get off the horse on the sidewalk. Long story short… in context of traffic 90% or more of “absteigen” will refer to bikes. Is that idiomatic? Like, would a cop say that? Or would that sound like the cop read lots of Shakespeare? I don’t think it is un-idiomatic, but I suppose it is somewhat more “erhoben” than “get off”. You definitely see “dismount” on signs – do a google image search for “please dismount”. Don’t you wanna make another entry into your online course and teach us how to make them? Have no idea how much work that would be, but if you do it I make a nice donation! Thanks a lot, it sure helps. Prefixes… not all of them, but it’ll be a good resource. Thanks for the flashcards, they are really useful! Ich versuche, auf Deutsch zu schreiben. Ich danke Ihnen für die Anki Flashcards und den Artikel. Die Anki Flashcards sind sehr hilfreich. Deine Posts hat mir sehr viel gehelfen, aber in diesem Artikel gibt es nicht so viel Witze. :( Ich glaube, dass ich mehr bei lustigen Artikelen lerne. As a professional mariner, I would say there is a big difference between a jetty and a dock/pier. Ships moor at docks and piers. A jetty is often piled up rocks and stuff used for a lot of other purposes, like breaking up wave patterns that lead to beach erosion. Oh, then jetty is not the correct term. A “Steg” is only for boats and it’s usually small and made from wood. Thanks for clearing that up. Would a line of thick wooden posts used for that purpose (breaking up currents/wave patterns at a beach) be a jetty as well? We were just up on the Ostsee/Baltic coast a couple of weeks ago, and the beach nearest us had a whole series of them – and I had no idea what they’d even be called in English. and they really take away from the whole beach experience… at least, in my opinion. 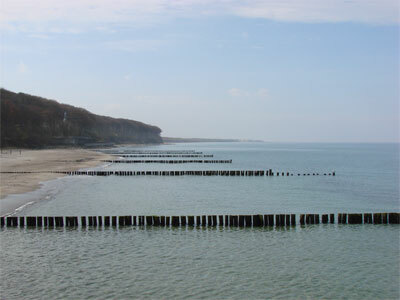 An occasional Wellenbrecher is all right but at some parts of the “Ostsee” they’re spread out over kilometers and it’s not a nice sight. I thought they were pretty. :) We were in Zempin (on Usedom), where there are only about 6-8 of them over a stretch of maybe a kilometer. The term that comes to mind is “breakwater”, but funnily enough, I saw this just the other day: http://www.bbc.com/news/uk-england-dorset-34254958 . So maybe they were “groynes”? I’m gonna go with “groynes.” Glorious word. It’s like “groins” but more olde-timey and British. Yeah, but just like “groins” they keep something at bay (or should I say “belly”. And by the way… “groins” are “die Leisten” in German and a “Leiste” is a long wooden stick. That can’t be a coincidence. My guess is free masons… I really have to find my tin hat again. Hah.. ja, nicht so viele Witz diesmal. Die besten Witze sind die, die spontan kommen, und manchmal kommt einfach lange nix. Wie bei der U-Bahn… haha. Aber im Ernst, es kommen auch wieder Posts mit mehr Witzen, keine Sorge. Dein Deutsch ist übrigens ziemlich gut. Nicht perfet, aber auf jeden Fall gut genug um nur noch Deutsch zu schreiben. Weiter so!! Suchen Sie nach “treiben” auf dieser Seite. Oooohhhhhh. Ops. I was editing the post on “treiben” right before deciding to post this one. Thanks for the heads up!! hierher zu should be two words, right? I’m having a crisis of faith here. Should be “um hier herzukommen”, because the verb in question is “herkommen”? 1 and 3 make the most sense to me, but there are different opinions among native speakers when it comes to verbs with somewhat lengthy prefixes. They are all correct and you can find arguments for either one. I would lean toward the third but the first works for me, too. I would not use the second spelling but others might have a different opinion. There are no fixed rules there. is just plain wrong :). Sorry. I knew another verb to describe the notion of increase: “mehren”. For example: “Rufe nach Rücktritt von VW-Chef Winterkorn mehren sich”. What would you say is the difference? And what is your book about? Ich bin gespannt, dass du ein Buch schreibst! “mehren” is pretty rare, especially in spoken German. I think a good match is “increase in numbers”. You would never use it for stuff like temperature or prices. – Die Preise mehren sich. That sounds like there are more and more prices popping up. The book is about prefixes… some of them anyway. Yeah, that’s generally translated “be fruitful and multiply” (the New International Version has “increase in number,” though). Germans just love puns, huh? Ha, yeah… a lot of the issue is that the shadow of the King James translation really hangs heavily over any newer translation effort (like Luther here). Many of the popular translations these days are actually self-consciously in the KJV tradition (like the ESV that I usually use), so they tend to hold on to a lot of those familiar formulations unless they’ve gotten really archaic. The NIV, though, was a deliberate effort back in the ’70s to make a fresh start direct from the original texts, without reliance on older translations (hence “New” International Version), and while I don’t know that they would admit it, I think they somewhat self-consciously avoided a lot of those formulations in many places. It’s actually been really interesting to try to figure out what German Bible translation to use for myself. It doesn’t seem like there really is one that’s all that great – Luther ’84 is OK but still tends to read pretty archaic; Schlachter and Elberfelder are very accurate but are basically ugly or at least non-idiomatic German; Einheitsübersetzung is solid but can be kind of technical for general use. The more modern and idiomatic versions (Neue Genfer, Gute Nachricht, Neues Leben, Hoffnung für Alle) run increasingly toward paraphrase rather than translation. It’s just kind of weird, because in English there are really a lot of translations that are both idiomatic and accurate (to varying degrees, sure, but all usable). Ich glaube, mindestens drei Verben werden üblicherweise verwendet, die ähnliche Bedeutungen haben. Steigen, erhöhen und steigern. Du hast klar erklärt wie die Verben steigen und steigern unterschiedlich sind. Wann würde man erhöhen anstelle von steigern verwenden? Oder habe ich was ganz misverstanden? Vielen Dank für einen anderen interessanten Beitrag. Es gibt so viele Information, dass ich alles auf einmal nicht aufnehmen kann! Das ist aber gut und ich bin dankbar, dass ich irgendetwas mit ausführlichen Daten zu lesen habe, wenn ich bereit werde, weitere Dinge zu lernen. Wenn ich Probleme mit anderen Programmen haben, kann ich normalerweise diese Webseite nutzen, um alles aufzuklaren. Sehr gut gemacht! Ich freue mich auch auf dein Buch. Sag uns bitte Bescheid, wann und wie wir es kaufen kann. Yes, in English the “over/about X” can be omitted. Why is it that “aus” appears twice in “Thomas steigt aus dem Porsche aus.”? Thanks for the post by the way..
Good question! That’s German doubling up on the direction. The verb is “aussteigen” the thing you are doing that to is connected using the preposition “aus”. Having a prefix verb and a preposition is super common and somtimes the prefix and the prep are the same. – Ich steige in das Auto ein. Yes, it helps. It justs feels very weird (for now) to see the same word twice. Thanks! I have doubt about the word “erhöhen”. Should it be used like “steigen” (without mentioning who increases sth) or like “steigern” (mentioning who increases sth)? I guess there’s no clear difference then between “zunehmen” and “steigen”: Die Spannung steigt – Die Spannung nimmt zu? Well, “zunehmen” can also be “increase in size, weight” while “steigen” is focused totally on the aspect of height. A number that goes up. For instance, people can “zunehmen”, that means they gain weight. That would make no sense with “steigen”. But in the example with Spannung they both work. “steigen” sounds quicker and “morer” though. – Die Spannung nimmt zu. This is very moderately increasing tension. At least that’s how it feels to me. Hello, I understand that absteigen is to get off the bike or motorcycle, but what is it to get on it? Is it also einsteigen? Good question… that’s “aufsteigen”. For “einsteigen” you need a door. Super! Meine deutsche worter sind allen weg. Ich danke sie.